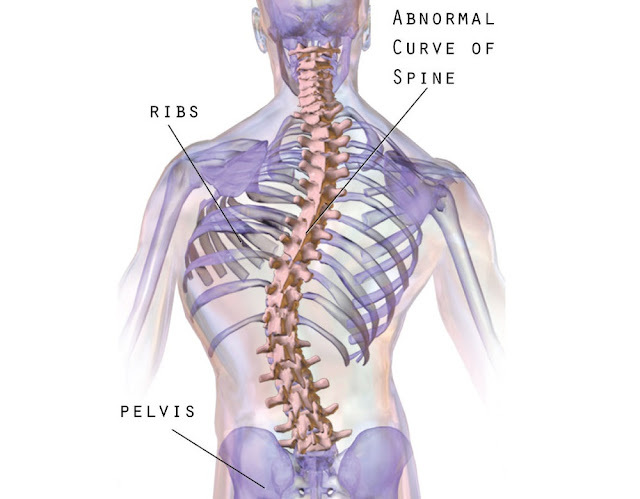 Within the abnormal curvature of the spine condition known as scoliosis , muscular imbalacement is very common. The muscles located at either side of the spinal curvature are heavily impacted by the condition, in most cases one side will be weaker than the other. The reason why this occurs is due to lack of use of certain muscles down one side of the back, consequently the stronger side is normally due to an over use of these muscles which is due to the curvature this side is having to work harder to help support the curve and back. Both the under used and over used sides of the back can cause problems regarding pain. An example of muscular imbalancement would be, if a patient has a spinal curvature which leans to the right this would cause the muscles on the right hand side to become stronger, these muscles will be used more frequently and will become more stretched out. However, the left hand side of the back the muscles will become weaker, this is because the muscles will be smaller as they are not been used as much and they will also become tighter due to their under use. Muscular imbalancement can cause a lot of pain and discomfort, due to the under and over use of muscles within the back.. Muscular imbalancement can also limit scoliosis patients who are heavily involved in sporting activities, this is because the imbalancement and limited mobility in some cases can prevent them from performing to their full ability or potential. Muscular imbalancement is something that Scoliosis sufferers are pretty much prone to, but luckily there are treatments to help reduce and monitor pain and discomfort that it may cause. Thank you for reading and I hope you found this useful in some way.